Re-discover Ballet BC in its triumphant return to the Jubilee stage after a 10-year hiatus, showcasing premiere Canadian talent in this tantalizing triple bill. With its fresh take on a traditional art form, brilliantly fusing ballet and modern dance, the company’s provocative choreography has exploded onto the world stage to great acclaim. Ballet BC’s Artistic Director, Emily Molnar C.M., has been hailed one of Canada’s “new generation of ballet sensations”, as she has steered the company into a golden era of innovation and collaboration since 2009. Inspired by two Brahms sonatas for cello and piano, creative personal touchstones for the artist throughout her career, and the poem “Lines for Winter” by Mark Strand, Crystal Pite continues her lifelong artistic exploration of tension and its resolution. Solo Echo moves from aggression to yearning, from the individual to the collective, travelling the pathways from conflict to acceptance. Enemy in the Figure is a dark and thrilling poem about vision and perception, form and chaos. Light—as integral to the performance as its choreography—intensifies the ephemeral beauty of the movement. In a universe alternately frenetic and calm, Enemy in the Figure presents a non-narrative of mystery and urgency, isolation and connection, the mechanical and the human: dance as a medium for infinite possibilities. A new experience for even the most seasoned patrons, Ballet BC’s exalted and exquisite dancers will shatter your assumptions of what ballet can be. 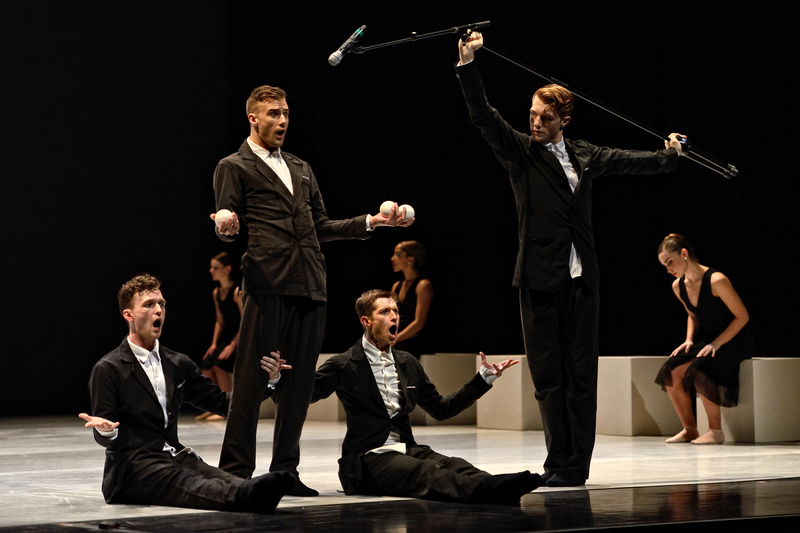 Originally choreographed for Ballet BC in 2011, this work is a powerful and poetic full-company piece created by rising European dance star, Medhi Walerski. Intrigued by the idea of “life in a box”, Petite Cérémonie is a surprising and delightful mix of dance and theatre, full of imagery and adventure. Ballet BC is co-presented by One Yellow Rabbit and Alberta Ballet. One of Canada’s premier dance companies, Alberta Ballet is committed to an artistic vision of powerfully exciting dance. For more information on this show, please contact the High Performance Rodeo at 403.294.7411 or info@hprodeo.ca. "Cultivating a new landscape of ballet." "Ever pushing the envelope, defying expectations, and defying the odds, the premiere dance company has become the go to in terms of avant garde performance art." A group of people searching for the right space, the perfect balance. Men and Women. Different brains. Boxes and wires trying to connect, to create a congruent image. As a starting point, I asked the dancers to tell me what “life in a box” meant to them. This is what came out. I would like to thank the dancers for their work, creativity and positivity, as well as Sylvain Senez and Emily Molnar for their support.